Last week, all of us gathered in Albuquerque, N.M., for Phase III of our YDLI advocacy training. YDLI, the Young Dairy Leaders Institute, is a nationally-recognized program through the Holstein Foundation that provides leadership and communication training to dairy advocates between the ages of 22 and 45. This program is amazing. I learned so much, made 50 new friends, and feel much more comfortable reaching out and working with the media and my local legislators to positively represent the industry that made me who I am, the dairy industry. YDLI is a must for dairy industry leaders and advocates. Last year, we met in Albuquerque for Phase I and then took our training out into our communities. 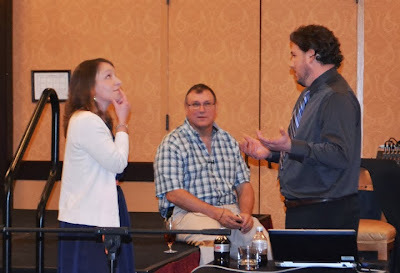 My projects included a media training for dairy students at the Western ADSA-SAD meeting, a communications seminar at the national American Dairy Science Association meeting, consumer interviews and maintaining my blog, among other assignments. I am so glad I made an impulsive decision a few years ago to apply to be in YDLI. I would recommend other young dairy folks do the same. You won't regret it! The week started with a tour of a dairy near Albuquerque, followed by wine tasting at a local winery. We have such an awesome class and it was so much fun to see them all again. We covered so much last week, not to mention in the last two years. I came into the program with more communication training than the average person, but it still TERRIFIED me when a reporter stuck a microphone in my face. Now, it doesn't bother me and it's easier to stay calm. That was one of the biggest things I got out of this program. Having a camera and lights in your face is nerve wracking! YDLI gave us the skills to feel more comfortable and confident in these situations. Here, we are discussing animal care. Advanced media training and taking on public policy issues as a panel tested our media and public relations skills. It was a lot of fun too! We each took on a different role (I was a concerned consumer) to discuss hot topics in the dairy industry during our three minutes in front of legislators (our advisors, see below). The conflict management techniques we learned are very applicable in a personal or professional setting. We also had the unique opportunity to hear from Joe Maxwell of the Humane Society of the United States (the animal rights group, NOT your local humane society) during a debate between Maxwell and Blake Hurst of Farm Bureau. Asking questions directly of someone whose organization strongly opposes our industry was interesting. Again, great opportunity to practice everything we learned throughout the week. Check our my friend and YDLI classmate Kerry's blog for more about our Saturday night Chile Cookoff! We also heard from several inspirational speakers and had a little downtime in the evening to visit with others in our class. Again, I am SO grateful for the opportunity to be a part of this great program. I wish I could do this every year! Check out my other YDLI blog post from this week for more photos.